Somaiya Daud is a Ph.D. candidate at the University of Washington. 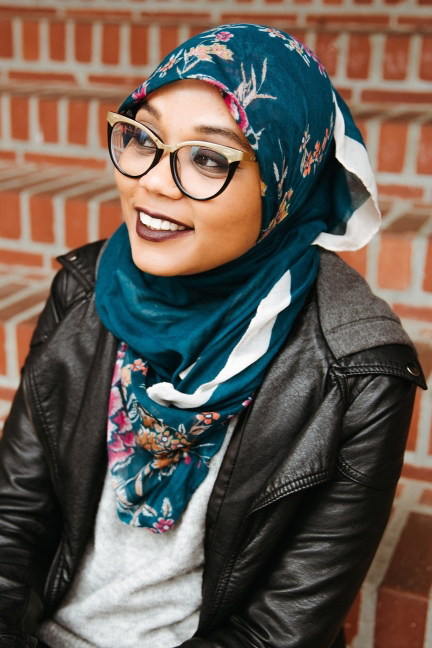 A former bookseller in the children’s department at Politics and Prose in Washington, D.C., Somaiya is passionate about Arabic poetry, the stars, and the Gothic novel. 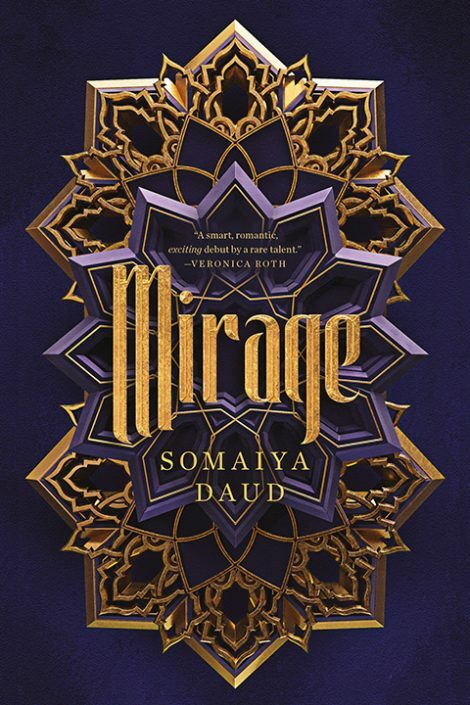 Mirage is her debut novel. On a small moon orbiting a large planet, in a small farmhouse in a small village, there was a box, and in this box was a feather. The box was old, its wood worn of any trace of design or paint. It smelled of saffron and cinnamon, sharp and sweet. Along with the feather there sat an old signet ring, a red bloom preserved in resin, and a strip of green velvet cloth, frayed around the edges. I crept into my parents’ room often when I was small, always to peek into the box. And its mystique only increased in my eyes when my mother began to hide it from me. The feather fascinated me. A five-year-old had no use for a ring or a flower or fabric. But the feather of a magical, extinct bird? Like all things from the old order, it called to me. The feather was black, made up of a hundred dark, jewel shades. When I held it up to the light it rippled with blues and greens and reds, like magic reacting to some unseen hand, roiling to the surface. It had belonged to a tesleet bird, my mother said, birds once thought to be messengers of Dihya. When Dihya wanted to give you a sign He slipped the feather into your hand. When He wanted to command you to a calling, to take action, He sent the bird itself. It was a holy and high calling, and not to be taken lightly. War, pilgrimage, the fate of nations: this was what the tesleet called a person for. My grandfather had received a tesleet, though my mother never talked about why or even who he was. “A foolhardy man who died grieving all he did not accomplish,” she’d said to me once. I stared into the old box, my eyes unfocused, my gaze turned inward. The sun would set soon, and I didn’t have time to waste by staring at an old feather. But it called to me as it had when I was a little girl, and my thumb swept over its curve, back and forth, without thinking. There were no tesleet left on Cadiz or our mother planet, Andala. Like many things from my mother’s childhood, they had left, or been spent, or were extinguished. All we had were relics, traces of what once was and would likely never be again. I jumped when my mother cleared her throat in the doorway. “Amani,” was all she said, one eyebrow raised. It was too late to hide the box, and I could not keep down the surge of guilt for having snooped in my parents’ room just to bring it out again. But my mother said nothing, only smiled and came forward, hand outstretched. “Did … did your father give you the feather?” I asked at last, and handed the box over. Her eyes widened a little. For a moment, I thought she wouldn’t answer. I rarely saw my mother look as she did now, soft and wistful, as if remembering a kinder time. She’d survived two wars: the civil war, and then the Vathek invasion and following occupation. She was hard, with a spine of steel, unbendable, unbindable, and unbreakable. “What was your moment of weakness?” I asked. I wouldn’t get a response. I never did. I didn’t know how to explain it, so I just shook my head and shrugged. She came forward and tilted my chin up. I was full grown, and my mother still towered over me by a full head. The backs of her fingers brushed over my cheek, tracing the lines where I would receive my daan—sharp geometric tattoos that would mark my first step into adulthood. I hoped they looked as hers did: stark and powerful, letting the whole world know who she was and where she was from in a single glance. I bit my tongue rather than say what I thought. We shouldn’t have to wait for them to pass. They should never be in the first place. We had suffered not only the burning of our fields this week, but the increased presence of the Vath. But my mother surprised me into silence a second time, and set the box back in my hand. I opened then closed my mouth, wordless with shock. “Really?” I said at last. My mother left me alone in her room, the box still clasped to my chest. After a moment I moved to hide the box away in my room, lest she come up the stairs and change her mind. The sun was setting truly now, and I hurried to put it away, and find my things. Khadija would be waiting, and I hated to hear her skewer me for my tardiness. Outside, the village was quiet. Normally, around now, I could hear the quiet singing of field workers as they made their way back to the village, and the ringing of the end of day bell. The march of boots, the cries of sellers hawking their wares in our small village square, dogs and goats crying out; all those sounds were absent. There were no fields left, not after the fire the Imperial Garda set last week. Rebels—or, more likely, starving thieves—had taken shelter in one of the gate houses. Rather than looking through each one, the Garda had set fire to the fields. We’d heard the rebels screaming from as far away as the village square. Now, with the fields gone, the village was counting down the weeks till winter, and the famine that was sure to follow. What would I want my own feather, my own sign, for? In the wake of this—of life—I had no need for a sign. I wanted something else, something more tangible and immediate. I wanted the world. The Vath were not settlers in our nebula—they’d lived on their planet, Vaxor, mostly peacefully and in accordance with galactic laws. But they’d poisoned their own atmosphere, and were forced to relocate to an orbiting moon. A stopgap measure, with an exploding population and a lack of resources. Some said it was inevitable that they chose to expand to other systems. There were moments when I glimpsed the world as it was before the occupation of the Vath. When my mother or father spoke without thinking, or a village aunt said “when I was young,” or a man sang an old song I’d never heard before. The bones of our old ways of life were there, barely traceable, and I wanted them back. I wanted all of us to remember what we’d been, how strong we were. And endurance was strength, to be sure, but even a rock wore away to nothing if asked to endure enough rain. I could want until I was dead and nothing would come to pass. Wanting never solved anything. I tucked the box away with a sigh, found my cloak and shoes, and made my way downstairs. In the kitchen, I packed away the last of the food we were taking with us. We were celebrating my majority night. I and twelve other girls had finally come of age, and as was our way, the whole village would travel to one of the abandoned kasbahs. There, we would receive our daan and become adults in the eyes of the village, and follow with dinner and dancing to celebrate. I turned to see Husnain, my brother, standing in the doorway. My parents had three children: Aziz, the eldest of us, more than ten years my senior. Myself, the youngest, and Husnain, fifteen months older than I was. I might have relied on Aziz for wisdom, but Husnain was one half of me, a twin despite the months between us. He had all the foolhardiness and fire of a second son, rarely tempered but for me. “I brought something for you,” he said when I sat down. I did so, but kept my hands outstretched. A moment later a wide, thin object was folded into my hands. I peeked before he told me I could open my eyes and nearly dropped the sheaf of papers as if they were on fire. Almost a month ago we’d journeyed to Cadiza Prime, the capital city on our moon, to pick up supplies for the small farm my brothers and father kept on our tiny sliver of land. I’d wandered through the open market, and shoved in the back of a bookstall was an aging sheaf of papers—Massinite poetry. It was too expensive to even consider purchasing it, and besides, most religious poetry was outlawed. It had been used too often as a rallying point for the rebels during the occupation. Massinia was the prophetess of our religion and though we all loved her, I loved her above all other things in our faith. Just as we had songs in her name, so too had an entire tradition of poetry sprung up venerating her life and accomplishments. I loved such poetry above all else, and hungered for it despite the risk of being caught with it. My hands shook as I reached for the collection. I was afraid to grin or to touch them. Mine! I could hardly believe it. I’d never owned a collection of poetry before. “Oh, for Dihya’s sake,” he laughed, and undid the twine around the pages before setting them in my hands. I would have to transcribe them to holosheets or put them in a database or some such. There was no telling if they’d survive the weather here, or if I would lose them or any number of things that could happen. And I would have to hide them, or risk them being confiscated by the magistrates. Our souls will return home, we will return, the first poem read. We will set our feet in the rose of the citadel. I closed my eyes, seeing the imagined citadel, no doubt now turned to dust. I could imagine the pain of the writer, could feel it like a bruise on my heart as my soul looked over its shoulder, leaving something treasured behind. I knew what it was like to trace a quickly fading memory in my mind, to watch it fade with every remembering until it was nothing but a feeling, a well-worn groove you could walk but not recall. The pain on the page was palpable—everyone had a citadel. The city of their birth, turned to rubble, family long gone, buried in an unmarked grave, all of it unreachable except through death. And this, poetry like this, was all we had to preserve our stories, our music, our history. “No!” But I could feel the lump in my throat, ready to dissolve into tears at any minute. I’d been so afraid, so nervous about tonight. And in the end, it was a night of joy. I would step into adulthood not just with family and friends, but now with a treasure that would comfort me on nights too difficult to comprehend. “Maybe now you’ll write some of your own,” he said, a little softer. I snorted out a laugh. I was a poor poet, to be sure, and in a world where poetry didn’t pay, I’d had no chance to improve. I flushed, hungry for praise. Husnain was the only person who’d ever read my poetry, but I knew he spoke out of the loyalty born between us and not out of any knowledge of what my skill looked like compared to true poets. “In another world,” I said, and clutched the poetry to my chest. Our souls will return home, we will return.